Background The amount of force applied on a device is an important measure to evaluate the endovascular and surgical device manipulations. The measure has not been evaluated for neuroenodvascular procedures. Purpose We aimed to study the use of force measure as a novel approach to test distal access catheter (DAC) performance during catheterization of cervical and intracranial vessels using patient specific 3-dimentional (3D) phantoms. Methods Using patient specific 3D phantoms of the cervical and intracranial circulation, we recorded measure of force required to deliver three types of DACs beyond the ophthalmic segment of the internal carotid artery. Six different combinations of DAC–microcatheter–guidewire were tested. We intentionally included what we considered suboptimal combinations of DACs, microcatheters, and guidewires during our experiments to test the feasibility of measuring force under different conditions. A six axis force sensor was secured to the DAC with an adjustable torque used to track axially directed push and pull forces required to navigate the DAC to the target site. Results In a total of 55 experiments, we found a significant difference in the amount of force used between different DACs (mean force for DAC A, 1.887±0.531N; for DAC B, 2.153±1.280 N; and for DAC C, 1.194±0.521 N, P=0.007). There was also a significant difference in force measures among the six different catheter systems (P=0.035). Conclusions Significant difference in the amount of force used between different DACs and catheter systems were recorded. 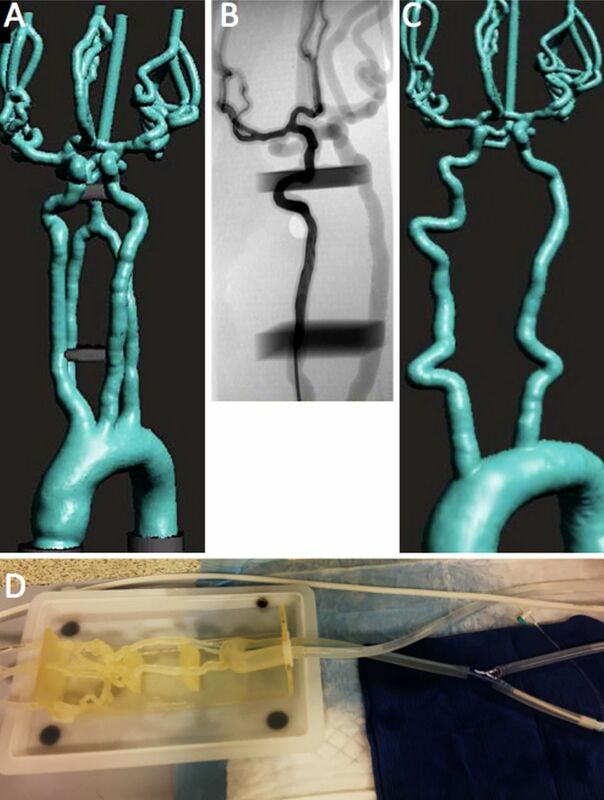 Use of force measure in neuroendovascular procedures on 3D printed phantoms is feasible. The expanding role of neurointerventional procedures for the treatment of cerebrovascular diseases depends greatly on the continuous evolution and development of novel devices. With a variety of new tools becoming available in the arsenal of practicing neurointerventionalists, we need to develop objective methods and quantitative metrics to compare their performance efficacy. Attempting to extrapolate data from clinical trials or individual case series to compared devices can be inaccurate due to differences in the study populations, inclusion criteria, and individual operative techniques. A comparison of more subtle and subjective parameters, such as tractability, support, or tactile feedback encountered while performing catheterization and delivery of catheters and treatment devices to the target site is even more challenging. Three-dimensional (3D) printed models are increasingly being used to assess the performance of devices for a variety of endovascular specialties, as well as for hands-on learning and training.1–3 Kinematic parameters, such as distance, speed, and trajectories for catheter navigation have been applied to measure operator performance and develop surgical robotic instruments and platforms for intravascular navigations.4–6 Measurement of force applied on the device is another approach to evaluate endovascular and surgical device manipulations.7–9 These areas of research are mostly limited to studies on cardiac, aortic, and peripheral vascular procedures. Here we validate the use of force measure as a novel approach to test distal access catheter (DAC) performance during catheterization of cervical and intracranial vessels using patient specific 3D phantoms. The collection of clinical data for this study was approved by the institutional review board. 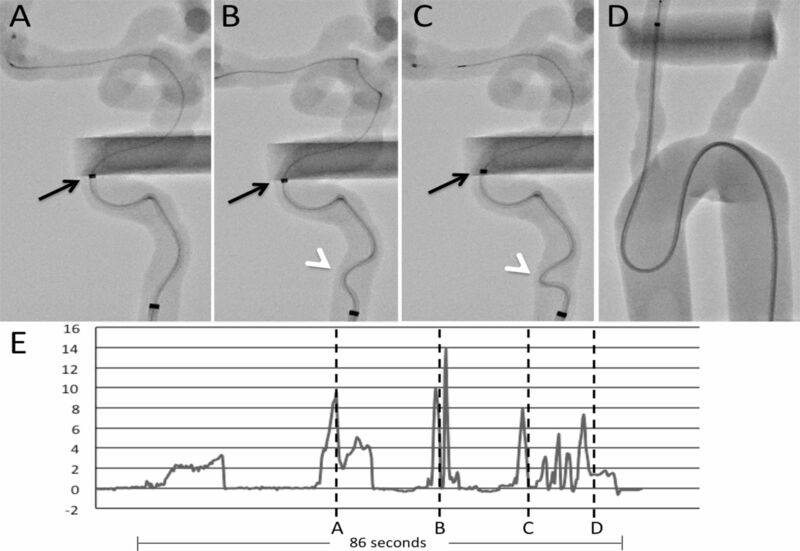 The design and manufacturing of the in vitro 3D phantom of the intracranial cerebrovascular circulation, and experiment set up, have been described in detail previously.10 11 Briefly, the models utilized in our experiments were designed to closely resemble the human cervical and intracranial anterior circulation by using CT angiograms from an anonymized patient library representative of cases with different types of anatomy. The design included the aortic arch, bilateral common carotid arteries and internal carotid arteries (ICAs), bilateral middle cerebral arteries (M1–M4 segments with smallest vessels of 1 mm in diameter), bilateral anterior cerebral artery segments and, in some cases, a posterior communicating artery, allowing near complete circle of Willis circulation (figure 1). Two anatomic variants representing ‘mild’ and ‘severe’ tortuosity of cervical and intracranial vessels were used in our experiments. The models were fabricated using a 3D printer (Object Model 260 V, Object-Stratasys Inc, Eden Prairie, Minnesota, USA) and TangoPlus material (Object-Stratasys Inc, catalog No OBJ-03224). Once the models were printed, the support material was removed manually from large diameter vessels using a power washer connected to a tubing system. For small diameter distal vessels, the models were soaked in sodium hydroxide solution for 24 hours, and the distal vessels were then flushed using catheters of various diameters. The model was connected to a pulsatile pump Masterflex (Cole-Parmer, Vernon Hills, Illinois, USA) to simulate cardiac output (figure 1). The circulating fluid (40% glycerol and 60% water) was maintained at 37°C. Three-dimensional (3D) cervical and intracranial circulation model. (A) 3D segmented geometric model of the cervical and intracranial circulation and (B) DSA, anteroposterior view, of a manufactured and fully assembled model, right common carotid artery injection. This model is representative of mild tortuosity. (C) 3D geometric model of the cervical and intracranial circulation representative of severe tortuosity; note multiple severe turns within the common and internal carotid artery, as well as type II aortic arch. (D) Photogram of the fully assembled model showing its anatomy, including the aortic arch, with inflow and outflow channels connected to the pulsatile pump simulating the cardiac output. A 9 F sheath allows the introduction of a guide catheter. We intentionally included what we considered suboptimal combinations of DACs, microcatheters, and guidewires during our experiments to test the feasibility of measuring force to evaluate and compare catheter performance under different conditions. Therefore, the results of our experiments are presented with anonymized DAC brand names (labeled A, B, and C) because our experimental design was not aimed to determine the DAC with the highest performance characteristics. A 6 F guide catheter sheath (Cook shuttle; Cook Medical, Bloomington, Indiana, USA) was placed into the segment corresponding to the proximal cervical ICA. Three different types of DACs (Navien 0.072 inch catheter by Medtronic, Irvine, California, USA; ACE68 by Penumbra, Alameda, California, USA; and Sofia 6F by Microvention, Aliso Viejo, California, USA) were used to measure the amount of force required to deliver each DAC to the target site. A 0.027 (Marksman; Medtronic) or 0.035 (3MAX; Penumbra) microcatheter, and a 0.014 or 0.016 guidewire were used for the experiments. Six different combinations of DAC, microcatheter, and guidewire were used to study how the choice of a delivery system affected the amount of force applied to the DAC. An experiment was considered successful if the DAC could be advanced beyond the ophthalmic segment of the ICA within 90 s. If the DAC could not be delivered to the target site within 90 s or guide catheter herniated into the aortic arch, the experiment was termed a ‘failure’. In order to minimize bias from improved skills in navigating through the same model, model type, model laterality, and choice of devices were changed after every 2–3 experiments. A six axis force sensor from ATI Industrial Automation (Apex, North Carolina, USA) was secured to the DAC with an adjustable torque used to track axially directed push and pull forces required to navigate the DAC to the target site. The force was recorded with LabVIEW (National Instruments, Austin, Texas, USA). For each chosen combination of 3D phantom tortuosity, DAC, microcatheter, and guidewire, a total of five experiments were performed by a single operator with 7 years' experience in neurointerventional procedures. A real time recording of the force in newtons (N) was retrieved from the LabVIEW for each experiment. The negative values (representing backward pull) were removed to calculate means (SD) for each experiment. Means (SD) were then calculated for experiments performed with each DAC and catheter system. ANOVA was used to compare mean force between groups of DACs and catheter systems. In order to assess the association of maximum push force with success or failure of access, we used the means of peak force for each push in each experiment. Means of peak forces between success and failure groups was compared using the independent Student’s t test. P≤0.05 was considered statistically significant. A total of 55 experiments were conducted with a continuous recording of force measure; in all experiments the provided data were suitable for analysis. DACs were delivered beyond the ophthalmic segment of the ICA in 10 (18%) cases. Examples of experiments with successful and failed delivery of DACs showing corresponding force measure records are shown in figures 2 and 3. Values of mean force according to the model design, type of DAC, and combination of DAC–microcatheter–guidewire systems are presented in table 1. We found significant differences in the average amount of force applied to each of the three DACs during our simulation experiments mean force for DAC A was 1.887±0.531 N, for DAC B, 2.153±1.280 N, and for DAC C, 1.194±0.521 N; P=0.007) (figure 4A). Depending on the choice of a catheter system (type of DAC+microcatheter+guidewire), there was a significant difference in the amount of force applied to the DACs (mean force value for system A, 2.040±0.54 N; system B, 1.579±0.385 N; system C, 2.153±1.280 N, system D, 1.598±0.223 N; system E, 1.376±0.496 N; and system F, 0.906±0.487 N; P=0.035) (figure 4B). Experiments that were successful in delivering DACs beyond the ophthalmic segment of the ICA recorded mean peak force for successful experiments of 4.847±2.855 N versus 7.570±3.932 N for ‘failure’ experiments (P=0.050) (figure 4C). DACs could not be advanced beyond the distal cervical ICA segment in 12 cases, petro-cavernous segment in 22, and ophthalmic segment in 13 experiments. Experiments were performed in models with ‘mild’ tortuosity in 33 cases and with ‘severe’ tortuosity in 22 cases. Mean force values were similar between these groups (P=0.787). An example of successful delivery of the distal access catheter (DAC) to the M1 middle cerebral artery segment. Under fluoroscopic guidance, ipsilateral oblique projection shows delivery of a DAC through the distal cervical (A), petro-cavernous (B), ophthalmic (C) and, finally, the middle cerebral artery M1 segment (D). Black arrows point to the radiopaque marker at the tip of the DAC. The white arrow shows the location of the 6 F guide catheter. (E) Recording of force applied to the DAC. The X axis (time) shows DAC location on panels (A–D) with a corresponding amount of force applied by an operator. An example of an experiment with failed delivery of the distal access catheter (DAC) to the target site. Fluoroscopy, ipsilateral oblique view showing failed attempts to deliver the DAC beyond a tortuous distal cervical segment of the right internal carotid artery (A–C). White arrows in (B, C) show a gradual buildup of tension within the body of the DAC, resulting in its kinking. Black arrows in (A-C) point to the DAC tip. (D) Additional attempts to push the DAC caused the guide catheter to herniate into the aortic arch. (E) Recording of force during the experiment. Note the excessive amount of force applied to the DAC (five distinct peaks with force range 7–14 N) in comparison with the experiment in figure 2. Measures of force recorded during different experiments of catheterization with distal access catheters (DACs). (A) Comparison of force among the three types of different DACs. Whiskers represent the full range of variation (from min to max), the IQR of the variation, and the median (solid bar within the box). The cross sign indicates the mean value while the dots represent individual experiment mean. (B) Comparison of force among the six different types of catheter systems. The composition of each system (DAC, microcatheter, and guidewire types) is listed. (C) Comparison of force between experiments with successful versus failed delivery of all three DACs to the target site. We intentionally included DAC–microcatheter combinations that were more likely to make the catheterization procedures more ‘challenging’. For example, for direct aspiration in stroke interventions, a 0.035 rather than a 0.027 microcatheter may reduce the chance of the DAC catching at the ophthalmic ICA segment. Similarly, we saw that when a 0.035 microcatheter was used, less force was required to the DAC than in experiments with a 0.027 microcatheter. Our study has several limitations. First, all experiments were performed by a single neurointerventionalist, thus alternative techniques in operating catheters and guidewires were not tested. Second, only six catheter systems were tested, whereas a higher number of combinations of DAC–microcatheter–guidewire exist. Third, while the models were designed to closely replicate patient specific anatomy, some of the anatomical components critical for the task of DAC delivery investigated in our study, such as the ophthalmic artery segment, were omitted from the final 3D model design. Fourth, additional confounding factors affecting catheter pushability and trackability were not controlled or recorded, such as friction of 3D printed model surfaces, durability of the test devices over repetitions, rate of advancement of the catheter by the operator, and relative movement of the combined devices (guidewire, microcatheter, and DAC). Finally, all experiments were performed in 3D models rather than in a real world clinical setting. It is possible the operator may have applied excessive forces that would not be used in real patients, which in turn could have exaggerated the differences in forces measures recorded among the different types of DACs or catheter systems tested. Use of force measure in neuroendovascular procedures on 3D printed phantoms is feasible. In our study, significant difference in the amount of force used between different DACs and catheter systems was recorded. Force measure may prove valuable for future design of catheters and neurointerventional devices, and in simulation training.
. 3D printing and its applications for aortic diseases. Cardiovasc Diagn Ther 2018;8:S19–S25.
. Learning-based modeling of endovascular navigation for collaborative robotic catheterization. Med Image Comput Comput Assist Interv 2013;16:369–77.
. Use of patient specific 3D printed (3DP) neurovascular phantoms for mechanical assessment of devices used in image guided minimally invasive procedures. Medical Imaging 2018:105790K. Contributors MM, MW, and AHS: study concept and design. MM, MW, SVSN, and NVK performed the experiments. MW: statistical analysis. MM and MW wrote the manuscript. All authors participated in data collection and analysis, edited the manuscript, and approved the final version. Competing interests EIL: shareholder/ownership interests in Intratech Medical Ltd, Blockade Medical LLC, and Medina Medical; principal investigator for Covidien US SWIFT PRIME trials; honoraria for training and lecturing from Covidien; consultant for Pulsar, Medina Medical, and Blockade Medical; other financial support from Abbott for carotid training for physicians. MM: consultant for Toshiba (Canon) Medical, Cerebrotech, and Imperative Care. AHS: grants from National Institutes of Health/NINDS/NIBIB and University at Buffalo–none related to the present study; financial interests in Hotspur, Intratech Medical, StimSox, Valor Medical, Blockade Medical, and Lazarus Effect; consultant for Codman and Shurtleff Inc, Concentric Medical, ev3/Covidien Vascular Therapies, GuidePoint Global Consulting, Penumbra, Stryker, Pulsar Vascular, MicroVention, Lazarus Effect, and Blockade Medical; speakers’ bureau from Codman and Shurtleff Inc; National Steering Committee for Penumbra Inc’s 3D Separator Trial, Covidien’s SWIFT PRIME trial, and MicroVention’ s FRED trial; advisory boards for Codman and Shurtleff, and Covidien Neurovascular; honoraria from Abbott Vascular, Codman and Shurtleff, and Penumbra Inc.
Ethics approval The collection of clinical data for this study was approved by the institutional review board. Data sharing statement All data are presented in this paper.